They ask for more green spaces and fewer urban developments. 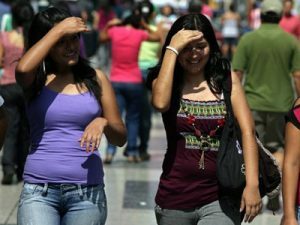 MERIDA — According to a survey conducted on Sunday May 21, people feel the climate is hotter than a few years ago. According to the interviewees it is because there are not many trees and in addition there are more and more real estate developments with no green areas. “No more concrete and more green areas,” say the citizens. Likewise, they commented that more and more green areas are being destroyed to replace them with construction, in relation to the controversy caused by the works in the park of Kalia. The interviewees said that the authorities should rethink their strategy of rebuilding parks and other public places, in addition to conserve green spaces and avoid deforestation. Reforestation should also be encouraged, the new real estate developments must have more green areas and there should be someone who takes care the trees do not die. They pointed out that this task is for all citizens and suggested that everyone plant trees in their homes and surroundings. According to experts, the heat wave that is currently felt is the most intense since 2003 and temperatures are higher than 40 degrees, so the mentioned survey was conducted in order to know the opinion of the people and their proposals to help improve this situation. “There’s more heat, now it’s unbearable at all hours and all seasons of the year,” said Abigail Balam. There are fewer green areas in the city, she added, but it could also be due to immoderate deforestation. “Legislation should be made to ban and punish illegal tree cutting, and to establish that housing areas have a minimum of green areas in proportion to the size of the colony and the number of inhabitants in the area, in a mandatory manner,” she said. Also, she added, the use of clean energy must be encouraged; that impunity is not allowed and that people who harvest trees and, in general, those who contaminate are effectively punished. “I feel the climate is hotter,” said Ernesto Martínez Salazar, a student and resident of the Xoclán colony. “I believe that this is due to the growth of the city, there are increasingly more inhabited areas and less green areas,” he said. At the same time, he indicated that the authorities should carry out “real” studies on the environmental impact and that more areas be reforested, that the new real estate developments should have green spaces and that the respective regulations must be accomplished. José Celis, a merchant, said that there is now more heat than in 2003. He felt that this is due to global warming, coupled with new construction that emerges day after day. “The authorities have made (zones) of pure concrete,” he said. “They must make more green areas, put an environmental law that helps the community not to destroy the few remaining,” he suggested. Several people were asked what they think about this heat wave and their proposals for the benefit of the environment.